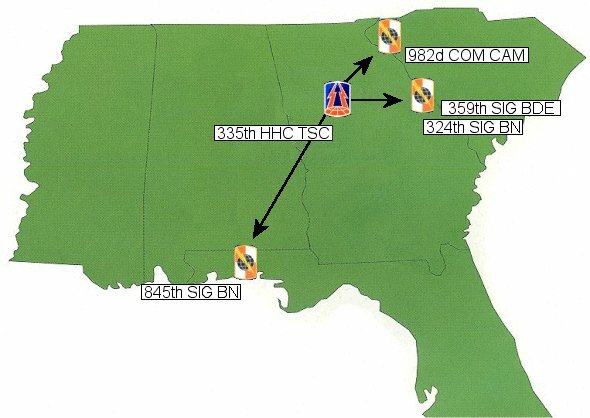 The 359th Signal Brigade is located at Fort Gordon, Georgia and is commanded by an Army Reserve Brigadier General. The 359th has command of the 324th and 845th Signal Battalions and the 842d Signal Company. The 359th Signal Brigade is one of three Signal Brigades under the command and control of the 335th TSC and is the USAR Brigade assigned functionally as well as operationally to the 335th. The brigade's Area of Operation (AO) is within CENTCOM's AOR as it conducts mission support of the United States Central Command in their Theater of Operations.